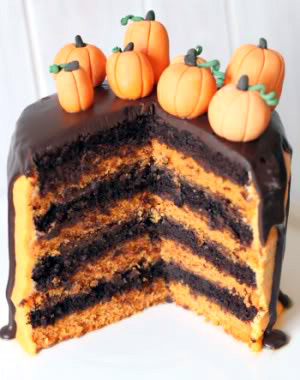 This chocolate orange Halloween cake is 100% whole grain and sure to be a crowd pleaser! 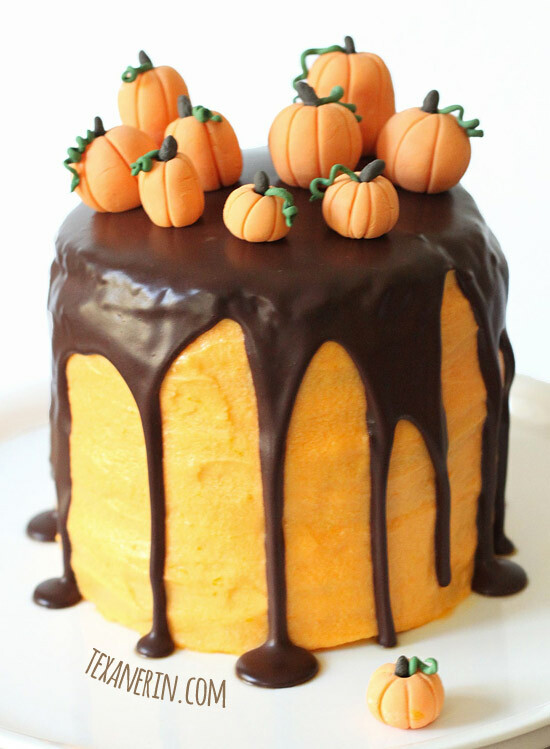 I originally posted this chocolate orange Halloween cake shortly after I started blogging two years ago. So why am I reposting it? 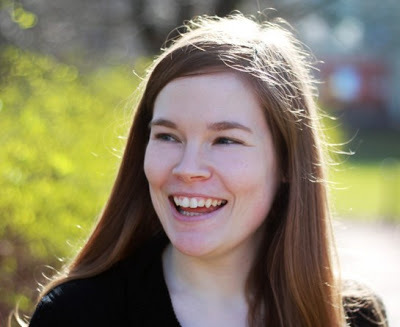 Because after two years – only a handful of people have actually seen it! Got time to waste? Here’s your cake! :D I wish I could say that I put this together in a jiffy but that’d be a gigantic lie. I recommend starting it at least eight hours before serving. There’s cooling and chilling time involved so it’s not all active time. So. 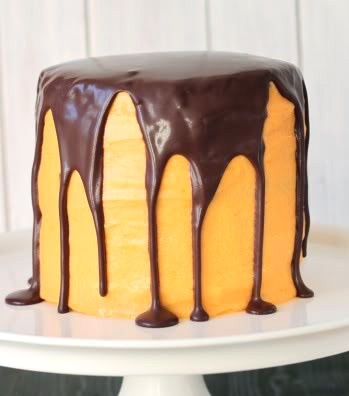 This is half orange cake and half chocolate cake. It has chocolate cream cheese filling, orange buttercream, and chocolate ganache. So, yeah. That means there are five different parts to the recipe. But if you want, you could just whip up your favorite frosting and top and fill the cake with that. It just wouldn’t be as pretty! I know that this was very bad of me, but I used some orange dye in the cake and the frosting. I’ve looked at some alternative “natural” dyes but they’re insanely expensive and the reviews are pretty bad. So I just used Wilton food gel that I got at Michael’s. You can certainly just leave it out. Whatever you do, don’t put the pumpkins on until just before serving! Or if you want to put them on a few hours before serving, that’d be okay. I put my little pumpkins on in the evening, and in the morning, they had fallen all over the place. And they were oozing. It wasn’t pretty. So good luck with the cake! And remember… start it well before you want to serve it! Preheat the oven to 350°F / 175°C. Grease two 6-inch pans. You could use 8-inch pans, but the layers will be thinner and you need to reduce the baking time. In a large bowl, stir together the sugar, flour, cocoa powder, baking powder, baking soda and salt. Add the eggs, milk, oil and vanilla, and mix for 2 minutes on medium speed with a hand mixer. Then stir in the boiling water. Batter will be very thin, almost as watery as water. Pour evenly into the prepared pans. I use a scale to make sure that they’re even. Bake for 20 – 25 minutes or until a toothpick inserted in the middle comes out clean. This cake is super super moist. 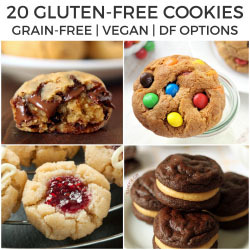 Don’t overbake! Cool for about 5 minutes in the pan, and then turn out onto a wire rack. Clean the pans so you can start with the orange cake. Preheat the oven to 340°F / 170°C. Grease two 6-inch pans. Combine the olive oil and sugar. Add the eggs and orange zest. Beat well. Add the flour, baking powder and salt and then slowly mix in the orange juice. 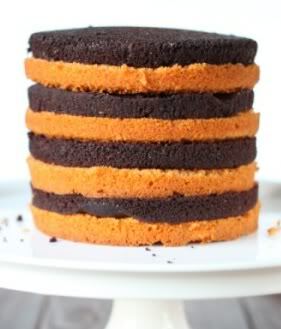 If you want the layers to be orange, you’ll have to use a little food coloring. It doesn’t take much (definitely waaay less than red velvet cake), at least when using icing gel. Bake for 25 – 30 minutes or until a toothpick inserted in the middle comes out clean. Let it cool in the pan. Add the powdered sugar, one cup at a time. Add the cocoa powder. Beat until fluffy! And try not to eat it all. You’ll need some for the cake. Germans: I used a 300 gram package and drained it a bit. It turned out to be around 225 grams. It’s just too runny if you don’t drain it at all. Cream together the butter and 2 cups of the powdered sugar. Stir in the orange zest and then the juice, and mix thoroughly. Beat in another 2 cups of powdered sugar and then the vanilla. Add the remaining sugar and beat very well. It should be fluffy. If you need a little milk, add it. If you want it orange, use a little food coloring. There was quite a bit leftover, but I’m worried that 2/3 of the recipe might not be enough. Place the chocolate in heatproof bowl. In a saucepan over medium heat, bring the cream to a boil. Pour the cream over the chocolate and stir until melted. Once your layers are completely cool, cut each layer horizontally in half so you have a total of eight layers. I used a cake leveler, but use whatever way you’re used to. You can start with either orange or chocolate on the bottom. I used about 2 tablespoons of filling on each layer, but I ended up with quite a bit leftover. I’d suggest using about 3 tablespoons of filling per layer. Apply a crumb coat using the orange icing. It can be messy. Look at mine. Notice all the crumbs and how crooked my cake is. I’m just not good at this decorating thing. I let mine sit in the fridge for a few hours until it was hard. And I mean hard. Add more orange icing. Make it pretty this time and then let it sit in the fridge again for another hour or so, or until it’s hard or almost hard. Pour on the chocolate ganache. I just poured all the chocolate in the middle of the cake and hoped it would run down nicely. Shortly before serving, put on the fondant pumpkins. Here's the fondant pumpkin tutorial. 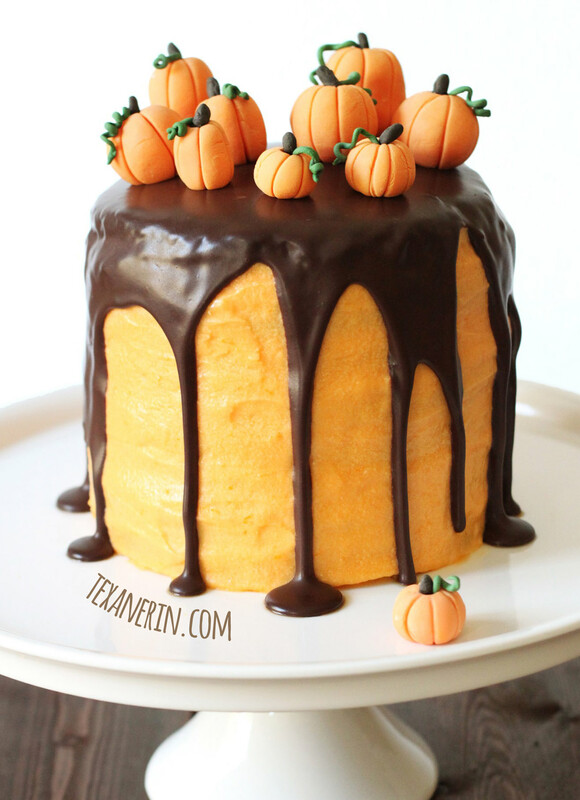 77 comments on “Chocolate Orange Halloween Cake (100% whole grain)” — Add one! I know this post is like super-old by now… but I want to say that I make the chocolate portion of this cake for EVERY birthday party in my family and have for over 5 years. It’s the bomb. Easy, delicious, healthy, fluffy. A super winner. Awesome! I’m off to check it out! Do you think this cake would work using flax eggs? I’ve never tried so I’m afraid I can’t really say. Sorry! :( If you try it, let me know how it comes out! Are you sure you’re not an expert? Because this here cake looks very professional. 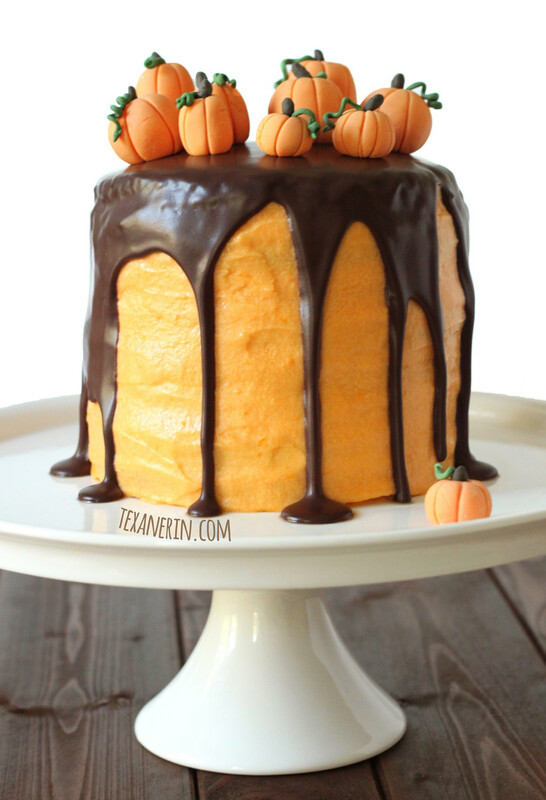 I love those cute little pumpkins that adorn the top. I’m craving a slice. Holy goodness, do you have patience!! I would have stopped with one cake and slapped a frosting on :) This looks so amazing! I am seriously floored by this! You worked so so hard and it is really such a pretty cake!! Love!